2-year manufacturer's warranty. Lifetime customer support. 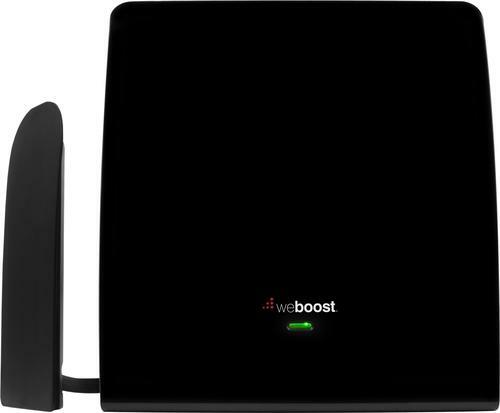 The weBoost EQO 474120 from wpsantennas.com is the an extremely simple plug-and-play cell phone signal booster. It takes less than a minute to install and does not require any technical know-how or outside installation. It's that easy. Depending on the outside signal, it is capable of boosting 3G & 4G LTE cell signals up to 1000 sq ft (about 1-2 rooms). Improved talk, text, uploads, downloads, and internet speeds instantly. 1-2 Rooms. Small office, home office. Apartment. Condo. Cabin/ Cottage. Desktop or workspace area. Any home or small building needing coverage up to 1000 sq ft (depending on outside signal). 700 MHz (Bands 12/17 and 13), 850 MHz (Band 5), 1900 Mhz (Band 2), and AWS 1700/2100 MHz (Band 4). Compatible with all 2G, 3G, and 4G services and cellular-enabled devices such as cell phones, tablets, iPhone, iPad, Samsung Galaxy, Android smartphones, and others. The weBoost 474120 EQO cell phone booster is a complete plug-and-play system that boosts cell phone signal in 1-2 rooms of a house or building. It does this with two main components. The Amplifier (Repeater) pulls in the outside signal then amplifies it up to 32X. The Inside Antenna then rebroadcasts the enhanced signal to area in need inside your home. More bars. Always connected. Reliable service for business, work, play, convenience, and emergencies. The weBoost EQO takes less than a minute to install and comes with a 2-year warranty. Made in the USA for highest quality assurance.